HDBSCAN is a clustering algorithm developed by Campello, Moulavi, and Sander. 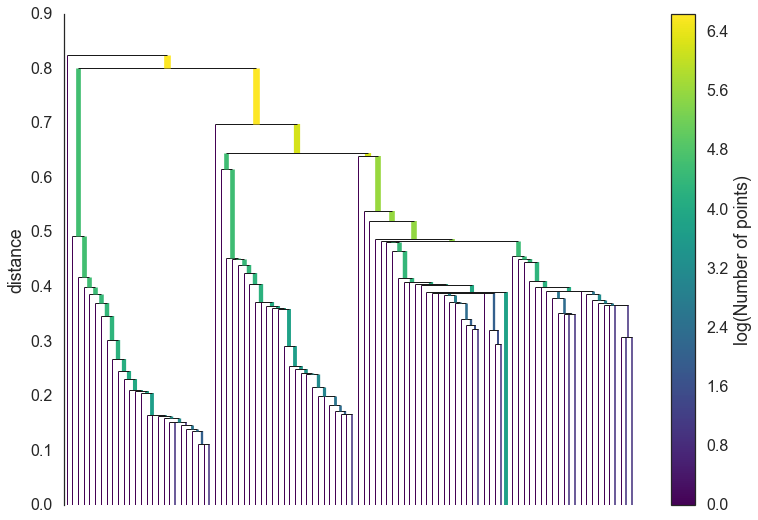 It extends DBSCAN by converting it into a hierarchical clustering algorithm, and then using a technique to extract a flat clustering based in the stability of clusters. The goal of this notebook is to give you an overview of how the algorithm works and the motivations behind it. In contrast to the HDBSCAN paper I’m going to describe it without reference to DBSCAN. Instead I’m going to explain how I like to think about the algorithm, which aligns more closely with Robust Single Linkage with flat cluster extraction on top of it. Before we get started we’ll load up most of the libraries we’ll need in the background, and set up our plotting (because I believe the best way to understand what is going on is to actually see it working in pictures). The next thing we’ll need is some data. To make for an illustrative example we’ll need the data size to be fairly small so we can see what is going on. It will also be useful to have several clusters, preferably of different kinds. Fortunately sklearn has facilities for generating sample clustering data so I’ll make use of that and make a dataset of one hundred data points. Now, the best way to explain HDBSCAN is actually just use it and then go through the steps that occurred along the way teasing out what is happening at each step. So let’s load up the hdbscan library and get to work. Transform the space according to the density/sparsity. 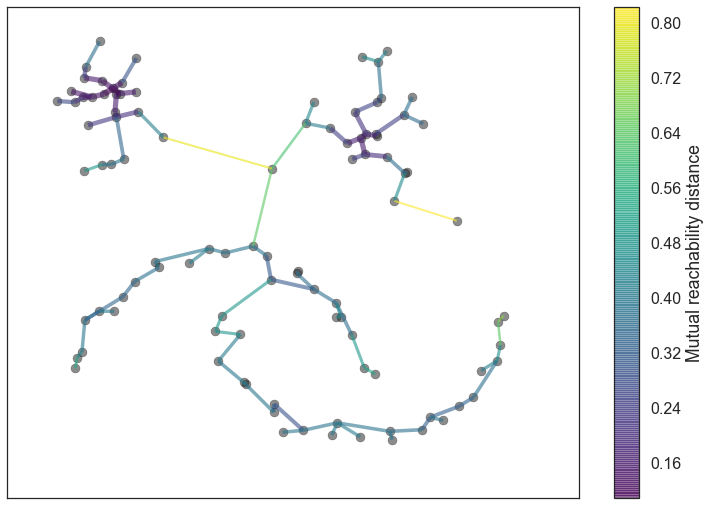 Build the minimum spanning tree of the distance weighted graph. Construct a cluster hierarchy of connected components. Condense the cluster hierarchy based on minimum cluster size. Extract the stable clusters from the condensed tree. To find clusters we want to find the islands of higher density amid a sea of sparser noise – and the assumption of noise is important: real data is messy and has outliers, corrupt data, and noise. 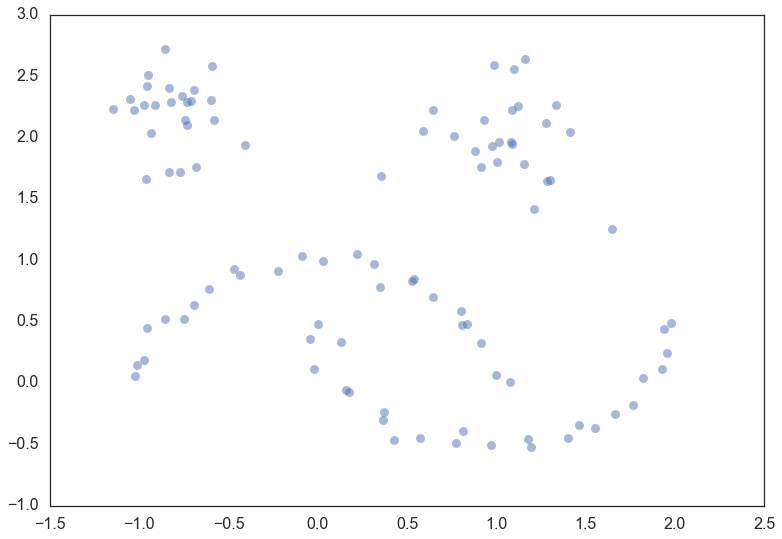 The core of the clustering algorithm is single linkage clustering, and it can be quite sensitive to noise: a single noise data point in the wrong place can act as a bridge between islands, gluing them together. Obviously we want our algorithm to be robust against noise so we need to find a way to help ‘lower the sea level’ before running a single linkage algorithm. How can we characterize ‘sea’ and ‘land’ without doing a clustering? As long as we can get an estimate of density we can consider lower density points as the ‘sea’. The goal here is not to perfectly distinguish ‘sea’ from ‘land’ – this is an initial step in clustering, not the ouput – just to make our clustering core a little more robust to noise. So given an identification of ‘sea’ we want to lower the sea level. For practical purposes that means making ‘sea’ points more distant from each other and from the ‘land’. Pick another point and we can do the same thing, this time with a different set of neighbors (one of them even being the first point we picked out). And we can do that a third time for good measure, with another set of six nearest neighbors and another circle with slightly different radius again. This passes through the blue circle, but not the green circle – the core distance for green is larger than the distance between blue and green. Thus we need to mark the mutual reachability distance between blue and green as larger – equal to the radius of the green circle (easiest to picture if we base one end at the green point). On the other hand the mutual reachablity distance from red to green is simply distance from red to green since that distance is greater than either core distance (i.e. the distance arrow passes through both circles). In general there is underlying theory to demonstrate that mutual reachability distance as a transform works well in allowing single linkage clustering to more closely approximate the hierarchy of level sets of whatever true density distribution our points were sampled from. Now that we have a new mutual reachability metric on the data we want start finding the islands on dense data. Of course dense areas are relative, and different islands may have different densities. Conceptually what we will do is the following: consider the data as a weighted graph with the data points as vertices and an edge between any two points with weight equal to the mutual reachability distance of those points. Now consider a threshold value, starting high, and steadily being lowered. Drop any edges with weight above that threshold. As we drop edges we will start to disconnect the graph into connected components. Eventually we will have a hierarchy of connected components (from completely connected to completely disconnected) at varying threshold levels. In practice this is very expensive: there are edges and we don’t want to have to run a connected components algorithm that many times. The right thing to do is to find a minimal set of edges such that dropping any edge from the set causes a disconnection of components. But we need more, we need this set to be such that there is no lower weight edge that could connect the components. Fortunately graph theory furnishes us with just such a thing: the minimum spanning tree of the graph. 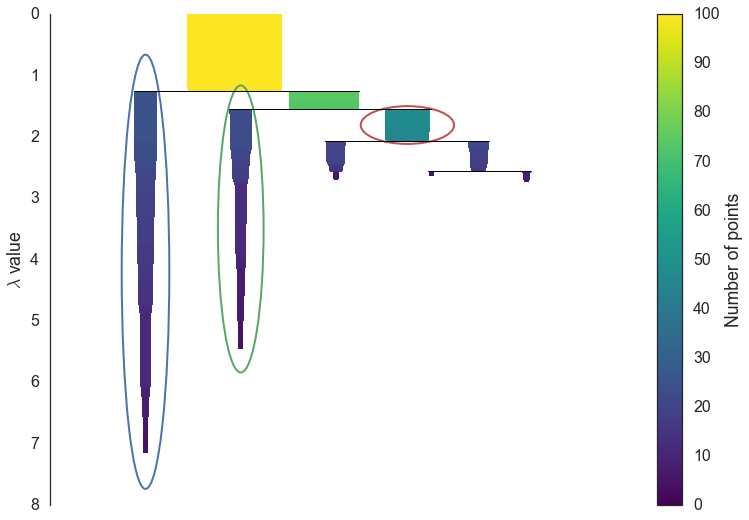 We can build the minimum spanning tree very efficiently via Prim’s algorithm – we build the tree one edge at a time, always adding the lowest weight edge that connects the current tree to a vertex not yet in the tree. You can see the tree HDBSCAN constructed below; note that this is the minimum spanning tree for mutual reachability distance which is different from the pure distance in the graph. In this case we had a k value of 5. In the case that the data lives in a metric space we can use even faster methods, such as Dual Tree Boruvka to build the minimal spanning tree. This brings us to the point where robust single linkage stops. We want more though; a cluster hierarchy is good, but we really want a set of flat clusters. We could do that by drawing a a horizontal line through the above diagram and selecting the clusters that it cuts through. 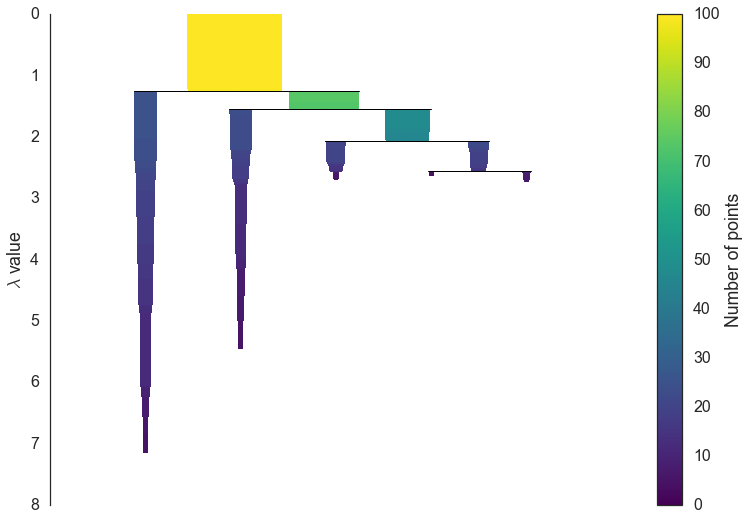 This is in practice what DBSCAN effectively does (declaring any singleton clusters at the cut level as noise). The question is, how do we know where to draw that line? DBSCAN simply leaves that as a (very unintuitive) parameter. Worse, we really want to deal with variable density clusters and any choice of cut line is a choice of mutual reachability distance to cut at, and hence a single fixed density level. Ideally we want to be able to cut the tree at different places to select our clusters. This is where the next steps of HDBSCAN begin and create the difference from robust single linkage. This is much easier to look at and deal with, particularly in as simple a clustering problem as our current test dataset. However we still need to pick out clusters to use as a flat clustering. Looking at the plot above should give you some ideas about how one might go about doing this. Intuitively we want the choose clusters that persist and have a longer lifetime; short lived clusters are probably merely artifacts of the single linkage approach. Looking at the previous plot we could say that we want to choose those clusters that have the greatest area of ink in the plot. To make a flat clustering we will need to add a further requirement that, if you select a cluster, then you cannot select any cluster that is a descendant of it. And in fact that intuitive notion of what should be done is exactly what HDBSCAN does. Of course we need to formalise things to make it a concrete algorithm. Declare all leaf nodes to be selected clusters. Now work up through the tree (the reverse topological sort order). If the sum of the stabilities of the child clusters is greater than the stability of the cluster, then we set the cluster stability to be the sum of the child stabilities. If, on the other hand, the cluster’s stability is greater than the sum of its children then we declare the cluster to be a selected cluster and unselect all its descendants. Once we reach the root node we call the current set of selected clusters our flat clustering and return that. Now that we have the clusters it is a simple enough matter to turn that into cluster labelling as per the sklearn API. Any point not in a selected cluster is simply a noise point (and assigned the label -1). We can do a little more though: for each cluster we have the for each point p in that cluster; If we simply normalize those values (so they range from zero to one) then we have a measure of the strength of cluster membership for each point in the cluster. The hdbscan library returns this as a probabilities_ attribute of the clusterer object. Thus, with labels and membership strengths in hand we can make the standard plot, choosing a color for points based on cluster label, and desaturating that color according the strength of membership (and make unclustered points pure gray). And that is how HDBSCAN works. It may seem somewhat complicated – there are a fair number of moving parts to the algorithm – but ultimately each part is actually very straightforward and can be optimized well. Hopefully with a better understanding both of the intuitions and some of the implementation details of HDBSCAN you will feel motivated to try it out. The library continues to develop, and will provide a base for new ideas including a near parameterless Persistent Density Clustering algorithm, and a new semi-supervised clustering algorithm. © Copyright 2016, Leland McInnes, John Healy, Steve Astels Revision d580ccb6.